Georgian Bay Forever posed a few questions to Dr. Janice Gilbert , wetland ecologist, to get her perspective on climate change, wetlands, and biodiversity for the Great Lakes and Georgian Bay. We are grateful for her time and insight. Question 3. What are three things we need to do to support or protect the wetlands in Georgian Bay? 1. Let’s protect and restore our remaining wetlands, both small and large. Be cautious and take steps to moderate development that severely impacts wetlands directly or indirectly i.e. roads, golf courses, cottage lots, trailer parks. 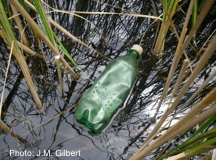 Plastics are becoming far too prevalent in our Great Lakes and coastal wetlands. minute particles and enter the aquatic food chain. As nature and outdoor activity enthusiasts, we all love to see and experience nature. We need to be aware that even with the best intentions, we are disturbing wetlands and natural areas. Awareness of the surrounding environment is key. Always take caution to try to follow created paths and watch your numbers when considering entering a wetland. We can unintentionally create more harm - it may be best to leave the wetland undisturbed and view from afar. Remember to exercise good judgement. 2. Work with your community to stop harmful activities such as ATV use through coastal wetlands. Not only is this activity very destructive to the native flora and fauna, it also promotes the introduction and spread of invasive species such as Phragmites. 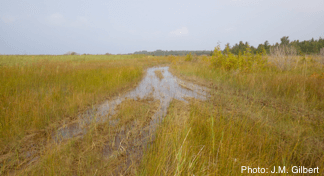 ATV use in Lake Huron coastal wetlands is a common occurrence. Enjoying the outdoors provides great satisfaction in life, but does disturb the environment for other creatures - some in ways that are more harmful than others. Certainly, we can take steps to reduce our footprint by following prescribed paths whether hiking, snowshoeing or using ATVs and snowmobiles as much as possible. 3. Institute an invasive species community watch program. With aggressive invasive species, an early detection and rapid response program is of immense benefit. Get educated about invasive species and engage your neighbours. Seek out Best Management Practices information from the Ministry of Natural Resources and Forestry (MNR-F) , Ontario Federation of Anglers and Hunters (OFAH) or the Ontario Invasive Plants Council (OPIC) . If the invasion is too large to deal with contact your local MNR-F office , OPIC /Ontario Phragmites Working Group (OPIC) , or Georgian Bay Forever (Coastal Phragmites Georgian Bay) for assistance. 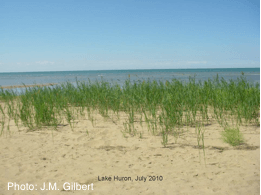 such as Phragmites before they become established. 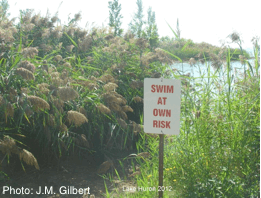 If left alone Phragmites will eventually overtake shorelines and entire wetlands. Question 1. How will climate change impact wetland biodiversity and how will this effect water quality? Question 2. In your view, what top five native species in Georgian Bay are at risk? Question 4. What are the top six invasive species that threaten the wetlands of the Great Lakes? According to the UN , half of the world’s wetlands have been lost since 1900. 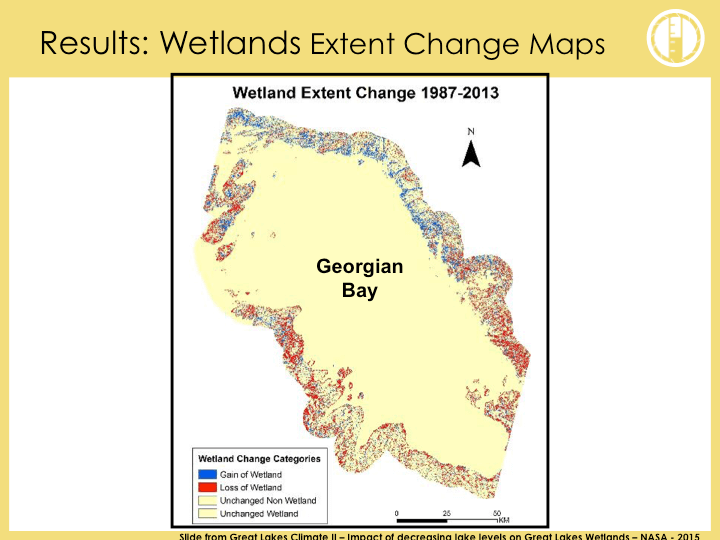 50% of wetlands in Lakes Michigan, Erie and Ontario have been degraded or lost due to human disturbance. However, in Lakes Superior and Huron including Georgian Bay, over 70% have been minimally impacted. 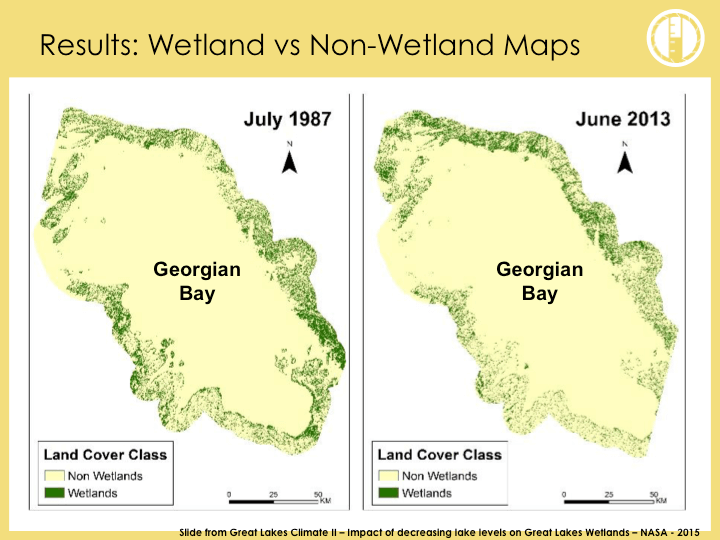 Between the high of 1987 and the low of 2013, GBF, NASA, and other partners found a 10.8 per cent wetland loss in the Southern region of the Georgian Bay and a 7 per cent wetland gain in the North. In the summer of 2015, 16 communities and GBF helped to removed over 8000 kg of invasive Phragmites from Georgian Bay coastal wetlands. Georgian Bay Forever (GBF) has a comprehensive program to help your community remove invasive Phragmites from Georgian Bay coastal wetlands. To learn how to be a Phragbuster please visit this GBF webpage and or email us at georgianbaykeeper@gbf.org.